When I was back in the States over the holidays, I had an interesting dinner conversation with a friend of a friend. I can’t remember how it got started, but suddenly there I was, listing my favorite all-time movies. And in constructing my list out loud, I realized how many of my favorite films have to do with politics in some way, shape or form. 1. Reds. This may be my all-time favorite movie, period. It’s about a radical American journalist – Jack Reed – who becomes involved with the Communist revolution in Russia and tries to bring its ideals to the United States. (He’s also the author of Ten Days That Shook The World, if that rings a bell.) Why do I like this movie so much? I find the history of communism – especially in the United States – to be pretty interesting stuff. But this is also an epic film, told over generations, which intersperses a story of global political change with Reed’s rocky but ultimately, loving relationship with his wife, Louise Bryant. Oh and the cast? Warren Beatty, Diane Keaton and a surprisingly toned-down and moving Jack Nicholson. 2. Julia. Another film about war, this time World War Two. This play centers on a friendship between two women – American playwright Lillian Hellman and her lifelong friend, Julia. When Julia joins the anti-Facist resistance movement in Vienna, she asks her old friend Lillian to smuggle some money to the cause while travelling through Europe. This is fundamentally a movie about the love between two friends (set against a broader backdrop of Nazi Germany, anti-Semitism and Hellman’s on-again, off-again relationship with Dashiel Hammett.) Jane Fonda and Vanessa Redgrave star, but don’t miss the five-minute scene with Maximilian Schell. Priceless. 3. All The President’s Men. Yeah, I know. Like Godfather II (which I also love), they re-broadcast this baby far too often on TV. But what a great movie. It’s goes right to the nexus of corruption, money and power in Washington. Best of all, the whole thing has a thriller-like feel. Personally? My favorite scene is the one where the Dustin Hoffman character stays up all night drinking coffee and pumping some lady for information. Makes one proud to be a journalist. 4. Nothing Personal. If, like me, you have a quiet obsession with The Troubles in Northern Ireland, I’d highly recommend a small but powerful film that flew a bit under the radar screen called Nothing Personal. It’s a very intimate portrait of a handful of people on both sides of this conflict and how their lives – political and personal – intersect in complicated and dangerous ways. Warning: the ending will kill you. 5. 4 Months, 3 Weeks and 2 Days. So this is a pretty harrowing film all around. It’s about illegal abortion under authoritarian rule in Romania. Not everyone’s cup of tea, I realize; definitely mine. But the reason I list it here under political films is that despite the grisly subject matter, the film is a statement – and a re-enactment, of sorts – of what it’s like to live under authoritarian rule. At a political moment when we’re all trying to figure out what’s going on in Egypt, this one is worth a watch. But be sure to fasten your seatbelt first. 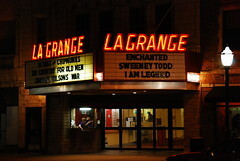 Image: Movie Theater by jimdeane via Flickr under a Creative Commons license.